I wanted to review this cookbook because I liked the sound of the idea. The concept is a good one to get busy moms back into the kitchen who have been relying too much on eating out or eating convenience foods because they're overwhelmed by the planning and prep time. The Stocked Kitchen has several copies of one main grocery list. As long as you keep mostly stocked with the items on that list, you can make any of the 300 recipes in the book. Recipes include appetizers, salads, soups, breads, pastas, meat/chicken, beans/potatoes/veggies, desserts, and breakfasts. I went through the list and actually had most of the items in my kitchen already. It wouldn't take much to get the extra things. And there aren't too many convenience/packaged foods on the list other than some canned goods and cake and brownie mixes. The list can be easily adapted to your specific dietary preferences. Though I saw several recipes in The Stocked Kitchen to try, I wasn't quite as excited about them as I had originally hoped to be - but that could just be my own food preferences. Keep in mind that the recipes are supposed to be simple with a variety of types of meals and not a lot of specialty ingredients. I did try the Chocolate Peppermint Bars (they were fine, but I would have to add something more) and the Baked Penne Pasta (my family enjoyed this and classified it a "keeper"). There are a few pictures of the recipes, all with white backgrounds, grouped in the middle of the book. 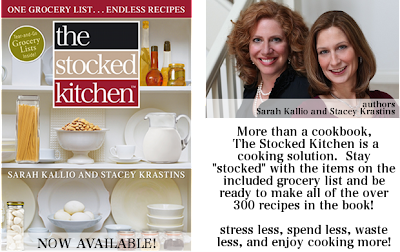 Overall, I think Sarah Kallio and Stacey Krastins came up with a great concept! And even if you don't love every recipe - if stocking your kitchen keeps you from eating out even one extra time a week or reduces your stress level in the kitchen, then it's worth it. To get a little more info, watch the authors talk about the book, try out some of the recipes from the website, or just buy the book here! Disclosure: I received a free copy of this cookbook to look through and post a review if I wished. My opinions, as always, are completely my own! How often do you rely on convenience foods or eating out for dinner? I admit - I used convenience foods (frozen - just heated up) last night for dinner as the boys had to head to Boy Scouts. The food was fairly healthy as it was all from Trader Joe's, but still definitely cost more than if I had cooked from scratch! I'm such a slacker friend for not being at least one of your commenters. But as you know it has been a busy week for me. Plus, you know. LOL! Big eating out just doesn't fancy me any more as I now love to cook and could have written this book size hugs to you. LOL!